Built in 1960 on the fringes of Heritage Hills, the long and low Oklahoma City Blood Bank replaced an aging two-story frame house in a residential area that was rapidly converting to a business district. The 5,200-square-foot building was composed of a series of zig-zagging, thin-shell concrete hyperbolic paraboloids hovering over a band of clerestory windows. 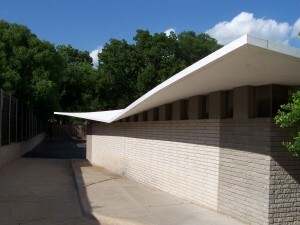 The building appears on the 2009 OKC MCM survey.